One of the great joys of any remodeling project is when you get to take down a wall. 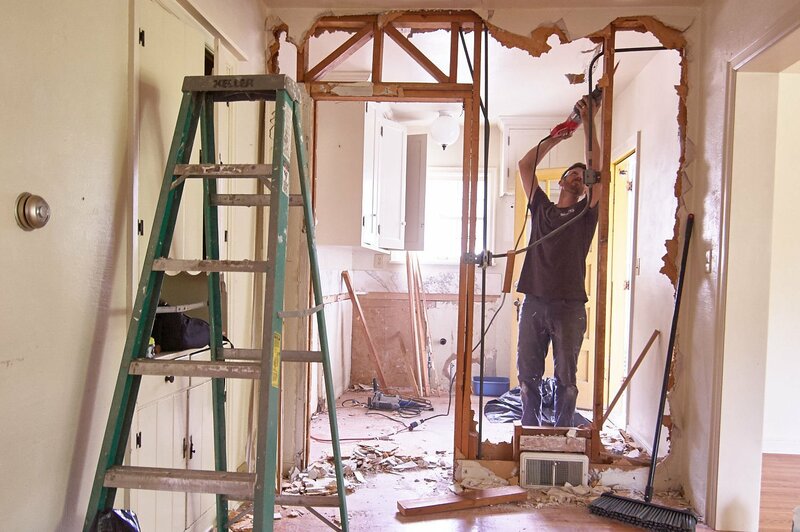 Not only do you get to swing a hammer, wield a reciprocating saw, and create an impressive mess, but when you're done, you've opened up a room and created a brand new space that wasn't there before. It's a little intimidating to make structural changes to your house, so here's a quick primer on how to make sure you do it safely. At its core, wall removal is not a delicate act. There's really no way to do it neatly, so just get used to the idea that you're going to make a mess. You can contain it by putting up plastic sheeting, and by covering floors that you want to protect. But just because it's messy, doesn't mean you can just start swinging a sledgehammer. There could be pipes, ventilation, and electrical circuits in that wall! And even more importantly, it could be load-bearing (meaning it's holding up a significant amount of the weight of the house above it, and transferring that weight down to the foundation). Before demolishing a wall, you have to inspect it. Is it load-bearing? To determine if the wall is load-bearing or not, visit the basement (or crawlspace), to check out the floor joists. If the studs of the wall appear to be at a right-angle to the floor joists, then the wall is probably load-bearing, and you should not remove it on your own. You'll also need to visit the attic to determine if any structural weight is resting on this wall. When in doubt, consult a professional; you don't want the house to come crashing down on you. If you know a wall is load-bearing, and you want to take it out anyway (this is really more of a job for a professional), you'll need to build temporary support wall out of 2x4s. If you're sure the wall's not load-bearing, then it's good to know if there are plumbing or electrical lines in it. You may be able to follow both plumbing and electrical lines from the lower level to the wall you want to demolish to determine if either are present. If they are, you may need to have these lines relocated before the wall can be removed. Regardless, turn off all electricity to nearby circuits before proceeding, and turn off any existing water and gas lines. Better safe than sorry. If the wall sports trim or molding, remove this first. Using a pry bar and hammer to remove the trim. A pry bar set like this one, which includes a slim-profile trim bar, will make it easier to remove trim without damaging it. Relocate the trim before proceeding - you don't want to accidentally step on those protruding nails! Note: always save removed trim! You never know when it'll come in handy. Using a razor, cut along the joint where the wall connects to the ceiling. If you are removing a section of a wall, measure and score the section as well. Using a regular hammer, start by smashing a small hole into the wall. Once you have determined you are far away from any stud, water lines, or electrical lines, make the hole large enough to fit two hands in. Smash what you can, and rip the remaining drywall off the studs. If any insulation exists, carefully remove it (wear gloves). Knock out the other side of the wall from the backside, using a hammer. Using a reciprocating saw, cut the studs at the bottom. Have someone help by holding the stud in place. Once you've cut through the stud and nails, pull the stud out from the top plate. I got to try out a new demolition blade from Diablo for this job, and I was really impressed with how quickly and smoothly it went through the wood. The Demo Demon Carbide pruning and fast clean wood blade has an aggressive tooth geometry that provides longer cutting life and faster cuts. When you're cutting out a lot of studs, speed matters. And this blade delivers. It has a non-stick coating to reduce gumming and friction and a strong, oversized body for extra toughness. Once all the studs are removed, you'll also need to remove the top and base plates. Use a pry bar to remove the top plate. Have someone hold the top place in place so it does not come crashing towards you once it's freed. Remove the base plate with a pry bar as well. This isn't really a step; more like a piece of friendly advice from someone who's been there. Make sure you clean up your space thoroughly after demolition (and in between steps). It's tempting to think that, because it's a construction zone, it's ok for it to be messy. But a messy jobsite is a dangerous one. People step on nails, trip on power cords, or get whacked by tools falling over. Don't do it! This post is sponsored by The Home Depot. Sponsored content helps defray the costs of photography, writers, editorial, and hosting, and lets us provide a the vast majority of our content for free. Thanks for supporting the brands that make Curbly possible.